Exploit kits or exploit packs refer to a type of hacking toolkit that cybercriminals use to take advantage of vulnerabilities in systems/devices so they can distribute malware or do other malicious activities. 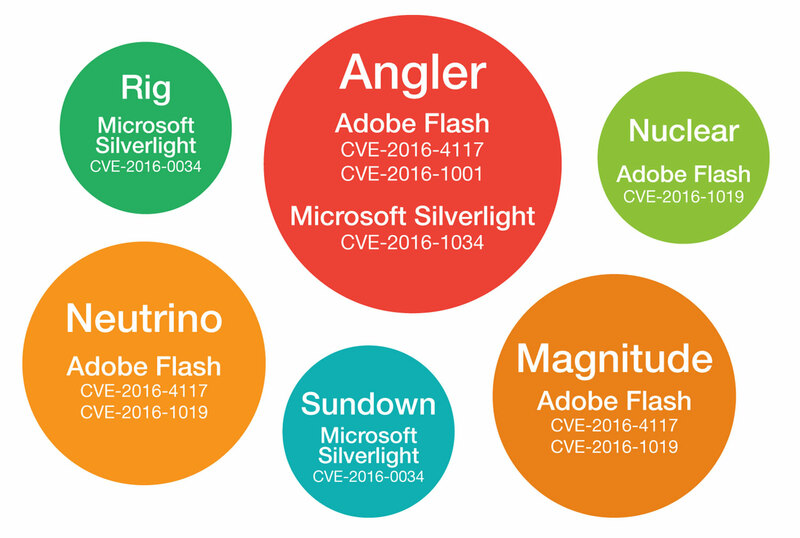 They normally target popular software such as AdobeFlash ®, Java™, Microsoft Silverlight® . 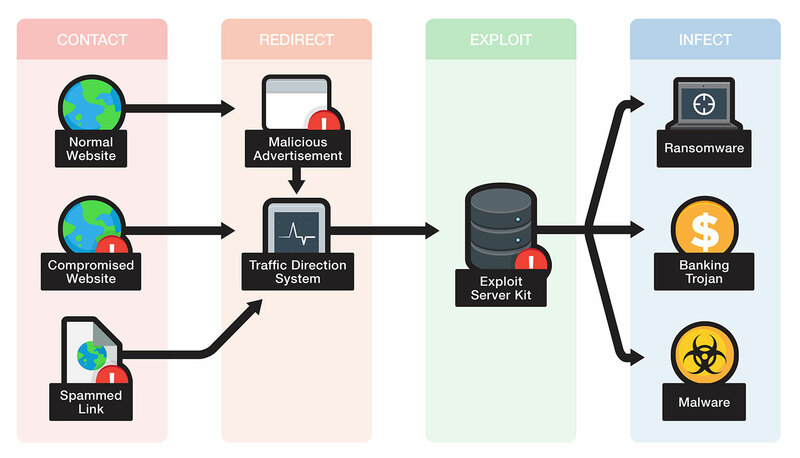 A typical exploit kit usually provides a management console, a bunch of vulnerabilities for different applications, and several add-on functions that make it easier for a cybercriminal to launch an attack. A n attacker convinces people to click the link to a site that serves an exploit kit often through spam and effective social engineering lures. The exploit kit finds vulnerabilities in software installed on the systems/devices used to access the link. An exploit that takes advantage of the vulnerability found is executed on the system/device. A payload (a piece of malware) is dropped and executed on the system/device. Exploit kits have proven efficient means to deliver all sorts of threats to vulnerable systems/devices. In 2015, then most active and popular exploit kit, Angler, started the wave of delivering ransomware to victims’ systems/devices. 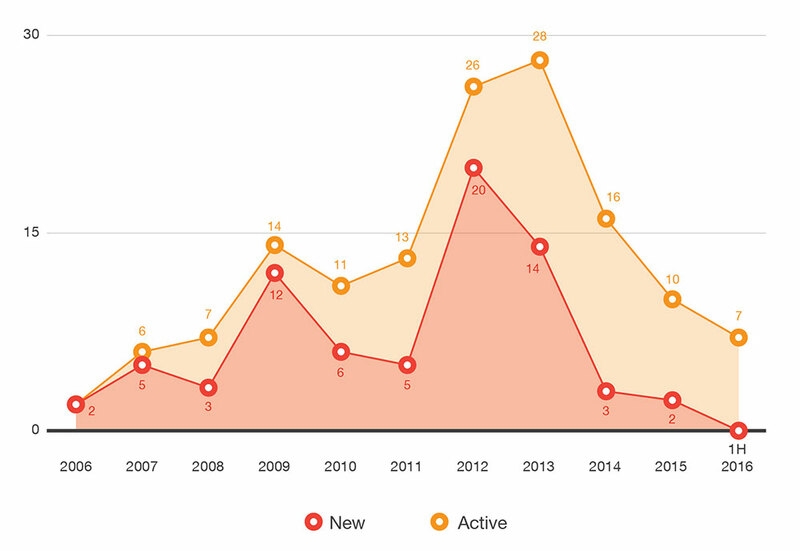 The Angler Exploit Kit accounted for 60% of the overall activity in 2015. It was used in a massive malvertising campaign that preyed on top-tier news, entertainment, and political commentary sites in March 2016, too. Angler was constantly updated to include new exploits, including those that were part of the Hacking Team leak and used in Pawn Storm, until the arrest of 50 people accused of using it for malware distribution, allowing them to amass US$25 million. Exploit kits typically integrate exploits for vulnerabilities in the most commonly used applications that many users leave unpatched. 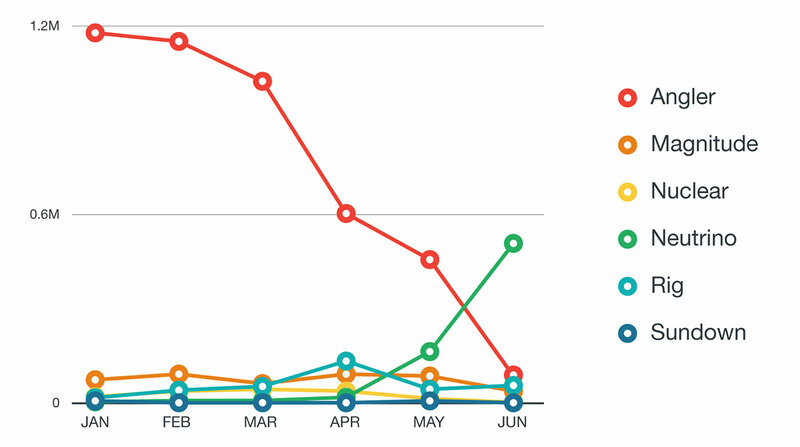 We identified five of the vulnerabilities most exploited by exploit kits from 2010 to the first half of 2016 below. Adobe Flash remains the most exploited software since 2010. Cybercriminals are clearly aware of the millions of developers that use it to create content for mobile and desktop consumption. Adobe Flash runs on more than 1 billion connected devices/systems to date. Exploit kits, the closest thing to a Swiss Army knife, remain a steadfast threat because of their track record. From fake antivirus to malvertisements and now ransomware, exploit kits have proven effective, enough to be constantly updated for more inventive and malicious uses. Shield your endpoints temporarily, until you can deploy patches, or indefinitely for out-of-support or unpatchable systems. We’ll help you prevent vulnerability exploitation (e.g., ransomware exploiting vulnerabilities) with easy- and fast-to-deploy intrusion prevention system (IPS) filters. So you get full protection until you can deploy vendor patches when it makes the most sense for your business. Vulnerability protection is part of the Trend Micro Smart Protection Suites. Trend Micro™ Deep Security™, meanwhile, powers Trend Micro’s Hybrid Cloud Security solution, providing market-leading security capabilities for physical, virtual, and cloud servers from a single integrated platform. Add to those TippingPoint Network Security Solutions that provide real-time network protection, visibility, and centralized management and analytics that are easy to use, configure, and install. All of these solutions contribute to the interconnected, multilayered security defense strategy that Trend Micro provides to protect your users and their data from vulnerability exploitation, regardless of device or location. Promptly patch all endpoints to block known exploits. Deploy a vulnerability shielding solution that proactively shields systems/devices from even unknown vulnerabilities via behavior monitoring. Update browsers and plug-ins to the latest versions and use a browser exploit prevention solution that secures against zero-day browser exploits.